South Wales and Monmouthshire Knight templars appreciated by the charity they support. For their strong support of the world-famous Eye Hospital in Jerusalem, the Templar knights of the Province were presented with a highly prized Award in January. A senior representative of the Hospital travelled from London to Neath specifically in order to make the Award to the province at the Installation meeting of Castell Nedd Preceptory – a sparkling occasion at which the Eminent Preceptor, E Kt Mark Nicholls, installed his successor E Kt Lee Saunders in the chair. The Great Sword Bearer of the Most Venerable Order of the Hospital of St John of Jerusalem E Kt Jamie Ingham-Clark, (who is also a Trustee and member of the Board of the Hospital) praised the brethren of Wales for their generosity and he officially announced that the knights of our province had now exceeded the target that had been set for the achievement of a Swift Award. 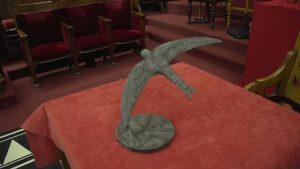 He therefore expressed great pleasure at being able to present a heavy bronze sculpture of “A Swift in flight” to the Provincial Prior of Monmouth and South Wales, RE Kt Dr Paul Calderwood. The Provincial Prior expressed the admiration of the brethren for the great work of the hospital (which is performed in one of the most troubled areas of the world) and he said how delighted and grateful the Brother Knights of Wales were to receive this beautiful mark of appreciation. This hospital is the principal charity supported by the United Orders and it provides free treatment to men, women and children of all religions – in an area where eye problems are a major issue and where the rate of blindness is ten times higher than it is in the West. The activity of the Order of Hospitallers in the 12th century, in having established a hospital in Jerusalem, is reflected today in the generous support given by the United Orders to the St John Eye Hospital Group based in Jerusalem. The group runs hospitals at Jerusalem, Hebron and Gaza as well as a clinic and an outreach programme – all with a staff of more than 230 people and in 2015 it treats more than 125,000 patients each year.